With new Single-Family Homes and Townhomes close to both nature and amenities, the relaunch of Arcadia in 2019 is one of Kanata’s most anticipated new developments. Located north of the #417 Trans-Canada Highway between Huntmar Drive and Terry Fox Drive, new homes for sale in Arcadia are just minutes from central Kanata, shopping, entertainment, and lush green spaces - such as the Carp River and the Feedmill Creek. 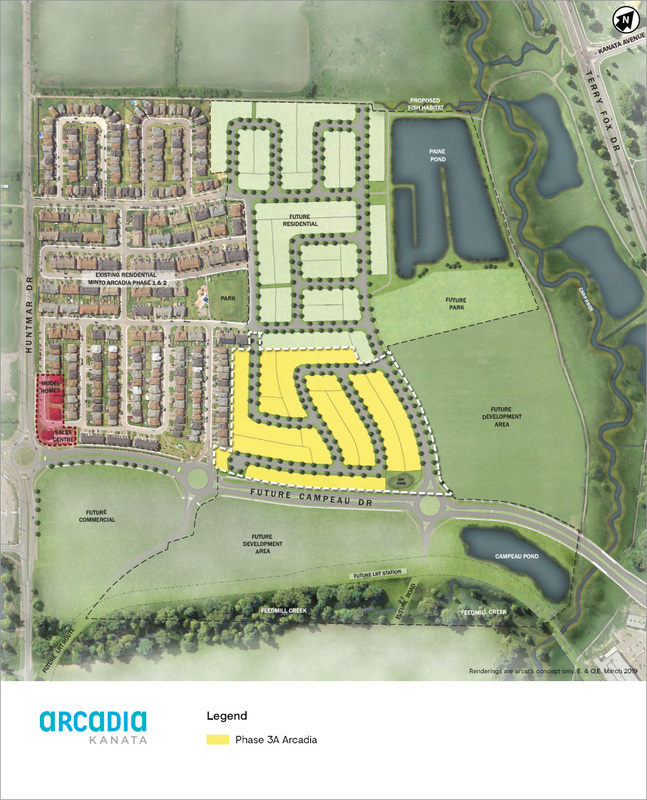 Want to know more about what's coming in Arcadia, Kanata? Read more. Located minutes away from central Kanata, Arcadia is a master-planned community, specifically designed based on its proximity to the Carp River and its extensive pathway system. These multi-use pathways and pedestrian bridges connect the community to nearby Kanata amenities. Arcadia’s community park features a large play structure, basketball court, soccer pitch, and plenty of space to spread out a blanket and enjoy the sun. The open field in the park is used for sports and recreation in warmer months, and the installation of a skating rink in the winter ensures the park can be used to its full potential year-round.